How much does it cost to travel to Shandong? How much money will you need in Shandong? ¥94 ($14) is the average daily price for traveling in Shandong. The average price of food for one day is ¥50 ($7.43). The average price of a hotel for a couple is ¥48 ($7.20). Additional pricing is in the table below. These average travel prices have been collected from other travelers to help you plan your own travel budget. Shandong Province, China is located on the Yellow Sea in the north eastern part of the country, with the Yellow River running throughout the province. The province is known for their natural beauty, ancient temples, and pristine cities. The province as a whole does not see many tourists, so expect to get some very friendly attention, especially when traveling through smaller cities. You'll find some of the best weather here during spring, especially in May when temperatures are in the high 60's Fahrenheit and you'll have plenty of sunshine. Shandong is in a monsoon region and does get heavy rain throughout the summer, don't let this turn you away though! Summers boast temperatures in the 80's making it a great time to visit beaches and enjoy the many summer festivals. Autumn sees comfortable temperatures and few tourist, while winters are not too bitter, seeing light snowfall and temperatures rarely going below 20 degrees. A popular destination for many is Confucius' birthplace in the city of Qufu, where you'll find the temple and cemetery of Confucius as well as sacred buildings including the Tomb of Shaohao. In Jinan, you can explore a few of their 72 natural springs and even take a boat ride through willow trees in Daming Lake Park. Qingdao is famous for their beautiful parks where you'll find everything from botanical gardens to ancient gates and sculpture gardens. They also have great beaches that range from the more crowded, family oriented to the remote and relaxed. Weifang is home to Wei Xian Memorial, which is dedicated to those who were interned in the concentration camp there during WWII, including the Western prisoners of war. One such POW, Eric Liddell, who was portrayed in the movie Chariots of Fire, is memorialized on the plaque here. Shandong is a fairly large province that can be divided into three main regions: Lowland, the west side that runs along the rivers; Highland, the hilly area in the center of the province; Coastal, the area on the Yellow Sea coast. The capital city of Jinan is located in the Lowland region; the city has been inhabited for over 4,000 years and is famous for having over 70 natural springs, many of which you can put your feet in on a hot summer day. Donying is an oil rich city that attracts many Western expats and is most known for their wildlife rich wetlands. 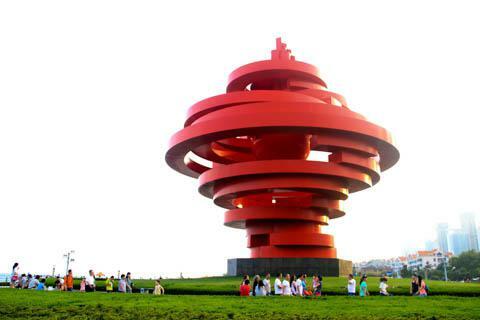 Qingdao is a beautiful, historically rich, beach town that was named China's most livable city in 2012. Weifang is a Highland city that is known as the "Kite Capital of the World" due to it's winds that make for perfect kite flying conditions. Yantai is a laid back Coastal city where you'll find a lot of expats and westerners teaching English, as well as some delicious fruit including cherries and apples. If you're around in the springtime, you must go to the International Kite Festival in Weifang. Here, thousands of kite flyers from around the world put their kites on display through various competitions, including synchronized flying, team competitions, and basic kite displays. If, instead, you're here in August, head over to the Qungdao International Beer Festival held at the end of the month. During the day, you'll find carnival rides and games, great food, and ceremonies celebrating Qungdao's brewing history. At night, the city comes to life as various beer companies come out selling food and drink and festival goers participate in karaoke, concerts, and even auctions. The local cuisine is called Lu cai, or simply just Lu, which is one of the eight culinary traditions of China. You'll find a lot of seafood, grains such as oats and barely, potatoes, peanuts, and vinegar. There are slight variations depending on which area you're in, for example, Coastal regions tend to include scallops in a quick stir fry while Highland cities generally use more vinegar and roasting methods. Shandong is a major wine producing region in China, most restaurans and bars will have the local choice, which is definitely worth a try! Beer is extremely popular here, especially with the Tsingtao Brewery located in Qingdao. Speaking of which, Qingdao is the major city for nightlife including big clubs and bars, while other cities tend to have smaller, more pub-like bars. Getting into the Shandong region is easy, you have a range of options including boat, plane, train, and bus. You'll find that many of the cities have good intercity transport options, including buses and bike rentals. Taxis are also a popular choice, although be sure to have the number of the taxi company as you may have to call for one since they don't always just roam the streets. Getting between cities is often done either on train or long distance bus. If you'd like to be more adventurous, you can actually rent a motorbike to navigate between and around cities.